Meghalaya Chief Minister Conrad K. Sangma was on Wednesday indecisive over the demand to institute an independent inquiry into the recent brutal attack on social activist, Agnes Kharshiing and her associate, Amita Sangma in East Jaiñtia Hills district. The Chief Minister instead said, a meeting would be convened soon to discuss the matter with other Cabinet colleagues, and take a call whether an independent inquiry should be instituted. “It is a serious matter, and we will take a joint decision on how to move forward,” he said. There has been a demand to have an independent probe into the incident where Agnes and Amita were attacked with an attempt to kill both of them by a group of more than 30 people suspected to be mining mafias at Sohshrieh in East Jaiñtia Hills district on November 8. Agnes and Amita were attacked after they returned from Ladrymbai after lodging a complaint against illegal mining and transportation of coal in the district. So far, only two persons, Elphon Dkhar (22) and Meklison Siangshai (26) were arrested by police. Condemning the attack, the Chief Minister assured stern measures to ensure that guilty are brought to book. “The Government will look into all aspects and all complaints (including illegal coal mining),” he said. 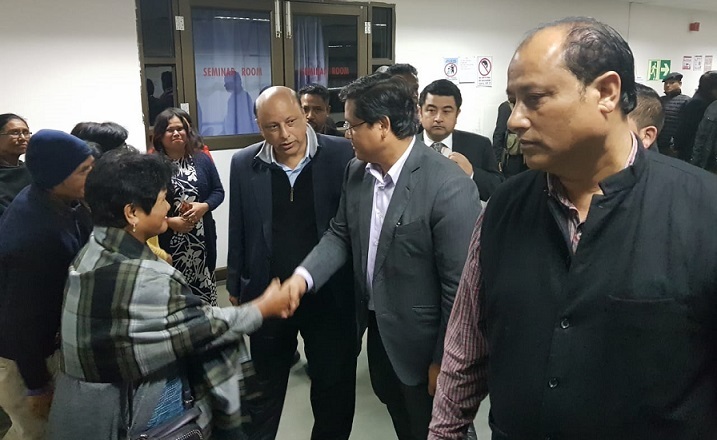 The Chief Minister visited Agnes and Amita at the ICU in North Eastern Indira Gandhi Regional Institute of Health and Medical Sciences (NEIGRIHMS) on Tuesday night, and assured all support as he expressed solidarity with the two critically injured women and members of their family.